VNF Commandant Rear Admiral Nishantha Ulugetenna greeting Navy Com mander Vice Admiral Piyal De Silva. Navy Commander Vice Admiral Piyal De Silva inspected the divisions of the Volunteer Naval Force (VNF) Annual Camp held at the main parade ground of the Navy in Welisara, recently. The VNF Annual Training Camp, which commenced on January 3 in view of updating professional skills and knowledge of Volunteer Naval Force personnel, marked its conclusion with activities comprised of the Navy Commander’s Divisions, a ceremonial parade, as well as a cultural show. The VNF, which was set up on January 9, 1952 with 24 officers and 121 sailors, has transformed to a stable force with 461 officers and 11,700 sailors to provide expertise and manpower in times of national urgency and distress, in parallel to the national requirement in defence and development. It supplements and provides the Regular Naval Force with required assistance in the execution of tasks entrusted to the Navy. 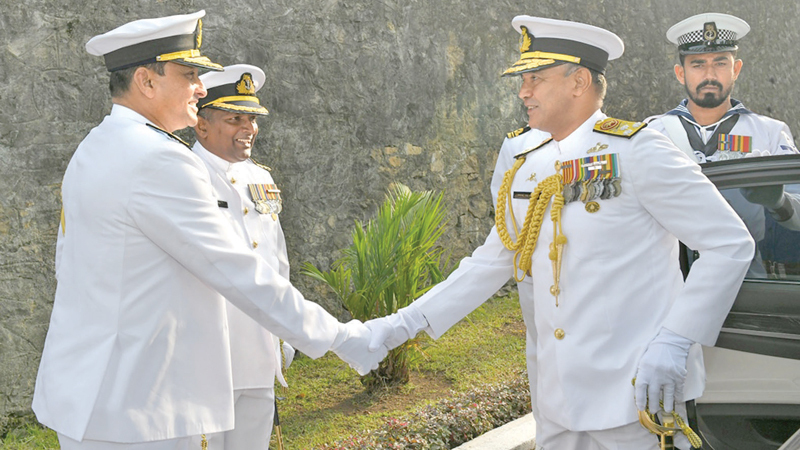 Western Naval Area Commander and VNF Commandant Rear Admiral Nishantha Ulugetenna, Director-Generals, Naval Headquarters and Western Naval Command senior naval officers, as well VNF Commanding Officer Captain Tony Perera were also present.